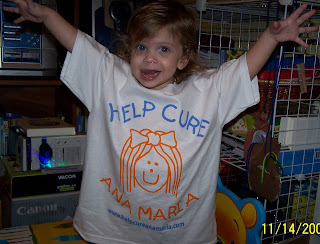 Want a Help Cure Ana Maria shirt? Contact us for size availability before you request one. If we have your size, we will send you one with a $25 donation. Part of the donation will cover the shipping. Want a Help Cure Ana Maria awareness band? Request one when you make a $10 or more donation. This amount helps offset the cost of shipping. They come in two sizes: youth (most women can wear) or Adult (most men can wear).